Triathlon Champ Camp emphasizes goal-setting, self-respect and personal best along with healthy lifestyles and competition. Campers will be divided into age groups to work on challenges and drills. Triathlon Camp is SOLD OUT, but you can still join the waitlist! Daily running, morning swimming workout and afternoon free swim. Bike safety and conditioning. Each camper must bring their own bike, helmet, and safety gear. Camp Undernight Wednesday, June 19 from 4-8 p.m.
Campers will go on a 10-mile bike ride; five miles out, a rest and then 5 miles back. 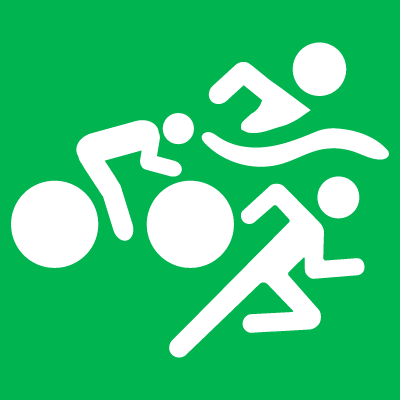 J Camp Mini-Triathlon - Friday, June 21 from 9:30-11:00 a.m.
Campers age 10 and over will run 2 miles, swim 200 meters, and bike 2.25 miles. J Campers who are entering 5th grade or older may get parental permission to leave J Camp when dismissed between 3:45 – 4:00 p.m. Parents may sign the parental permission form in the CampDoc Authorizations section. When parents give permission, once dismissed after Camp, campers 5th grade and older will not be supervised and parents must arrange a time and place to pick them up. The independent youth must be able to be trusted and agree to be in approved areas of the Jewish Community Campus. Approved areas include the Main Lobby, and if they are a J member, they must show their J membership card to go to open areas of the pool, gym or racquetball courts. Independent youth must behave themselves, and act appropriately. The J reserves the right to remove the option of a youth continuing to leave independently if they are not able to follow the rules.